Working with IT project teams for many years now, I've noticed an easily fixed issue that crops up in struggling projects year after year. I'm sure that I've written about it before, probably more than once and as it just happened again, I thought it worth a fresh reminder. 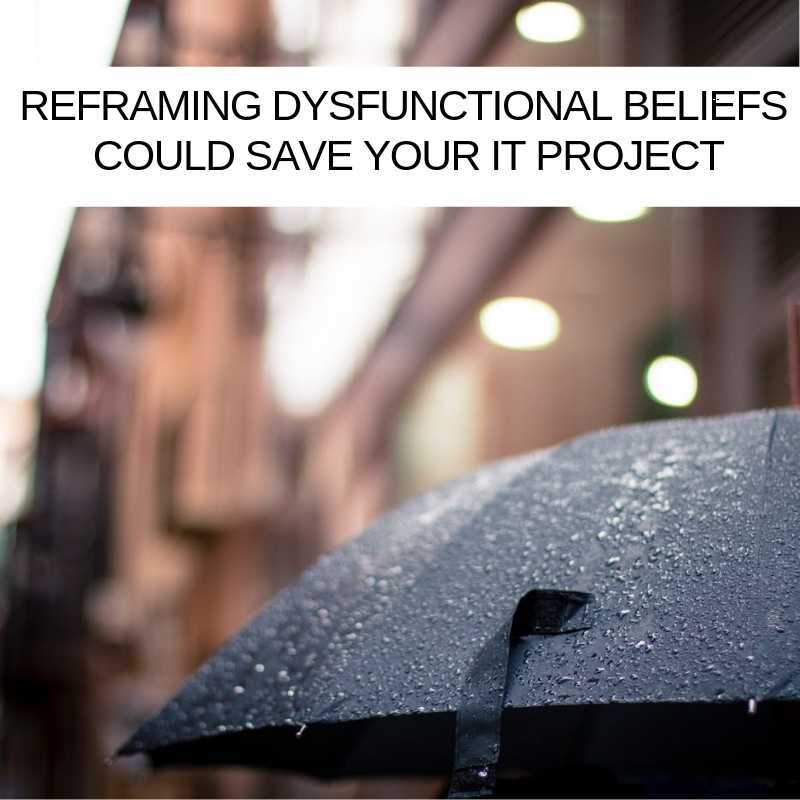 IT Projects are being choked and sometimes even killed by dysfunctional beliefs. Dysfunctional beliefs are neatly defined by the authors of "Dysfunctional Beliefs Affecting Stress" as having "to do with the actual content of thinking itself." Thoughts are powerful and over time become habits, in too many cases how teams think about the challenges they face is the greatest problem. My designer friends talk about reframing problems so that they are answering the right question and that's the challenge that we often face with our thinking. My designer buddy Sam uses this example to demonstrate reframing. Imagine you're at work on a cold, dark, wet November morning. It's raining so hard you can hear each raindrop smash against the corrugated iron roof of the office unit you are in. The wind is howling. You need milk from the local shop for your morning cup of tea. You're gasping for a brew but having tea without milk doesn't bear thinking about, I mean yuck!!! BUT You don't want to get your work clothes wet; who wants to sit in a soggy suit for the whole rest of the day? What do you do? Most people start to think 'how can I get to the shop for milk without getting wet?'. Take an umbrella? What about that wind? Wear a raincoat? What about your legs? Soggy skirts and trousers are no fun! You could run? 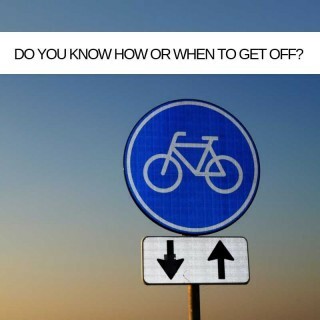 Or drive? It's raining so hard that you'd literally only need to step one foot out of the door to be soaked. The designer is minded to reframe the question so that it fits the actual problem. The problem isn't anything to do with the weather, or the shop, or even the milk. You're gasping for your morning cuppa remember - the outcome you want is to be drinking tea. The reframed question then is 'how do I get a cup of tea' - well it turns out that the local café delivers hot beverages and also has a really nice selection of cakes; perfect for a lousy morning! Maybe some examples from the IT Project Management world will clarify this. Here are five that I've encountered recently. 1 - "Hiring in Project Management as a Service resources is costly"
A CIO whose project was about to sink said this to me, having reached out for help. Two things here, first, the cost of not saving this project far outweighed any potential cost impact of taking action; the project was a key strategic business IT initiative and it was too important to fail. Secondly, often Project Management services can be accessed without net increases to your overall project portfolio budgets. It's worth asking the question at least. Your Project Management as a Service partner can help. 2 - "The buck stops with me, as a leader I have to cope with everything"
This is a bit of a throwback. I think most of us remember a "my way or the highway" type of project manager, a macho, alpha male type who was a bit of an ogre. These days project leaders are different, we are mostly great at delegating and while it is true that, as the person driving the project, you have responsibility for keeping it heading in the right direction, a project's success should never rest on just one pair of shoulders. Delegate to your team and dip into the Project Management as a Service universe for extra resources. 3 - "There's no room to make mistakes"
EEEEK! The best lessons that I've learned in my IT Project Management career have been thanks to a mistake that I or my team have made. Messing things up should be a basic human right protected by the United Nations! Post It notes, microwave ovens, Penicillin, inkjet printers, and potato crisps were all invented "by mistake". You should build in room for mistakes and make sure that you and your team learn from them. 4 - "The project is late"
Shhhh! Don't ever share this with your stakeholders; they won't appreciate it. The thing is - labelling your project as "late" is really demotivating. So, it's not late ... it's ... well, it's where it is. Once you have accepted where you're at you can deal with that! Dave Evans, from the Product Design Programme at Stanford and author of Designing Your Life puts it nicely when, in a Stanford e-corner lecture, he asked students if they'd ever felt 'late'. "For what?" he asked. "There is no such thing, you're just here." I love football when Manchester United played Bayern Munich in the 1999 Champions League Final they equalised after the ninety minutes had elapsed. Were they late? When Solskjær scored the winner three minutes into injury time was he late? No!! 89 minutes into the game the reds were losing, they weren't late, that was just where they were and they dealt with it. If you find that you are 'behind' and you realise it, then you can do something about it. Call your PMaaS partner and ask for suggestions, make adjustments to your portfolio and re-allocate resources, get advice from an expert at delivering projects into service. Even a project delivered "late" is a project delivered. Cut yourself some slack! 5 - "I have to get all of today's tasks done today"
Yeah, in an ideal world, in a perfect workplace - you'd get everything on your stuff to do list done today. Life and work doesn't always run to plan, there are fire drills and "happy birthday to yous" to sing; there are phone calls and emails with red flags on them; there are power cuts and power struggles. I worked with a guy once who used to (jokingly) say, "He who achieves everything today, gets made redundant tomorrow." It was his way of taking the stress out the fact that tasks were regularly getting passed forward to the next day. I think that as long as you have a plan and a schedule for how you'll achieve uncompleted tasks tomorrow, you can tick them off today's list. On a serious note, if you are finding that you are carrying many tasks forward every day, this may be a sign of insufficient resources. Again, having a fresh pair of eyes look over your workload can help and there are plenty of resourcing solutions in the Project Management as a Service market. This week, try to watch your thoughts and assess them to see if they are serving you well. Make it a habit to play devil's advocate and challenge yourself and how you're thinking. Ask others for input, take views from people who are different from you and get an independent, fresh pair of eyes to take a look at your operation once in a while. You literally would not entertain dysfunctionality in any other aspect of your project team, why should your beliefs get an easy ride.